Click on the Abstract to show/hide its content. 110. Y. Liu, R. Ganguly, H. V. Huynh, W. K. Leong, "Platinum‐Osmium Heterometallic Clusters Containing N‐Heterocyclic Carbene Ligands and an Electron Deficient Tetraosmium Byproduct" Eur. J. Inorg. Chem., 2019, accepted. The room temperature reaction of [Os3(CO)12] (1) with three molar equivalents of [PtCl(allyl)(NHC)] (2) in the presence of KOtBu afforded the heterometallic clusters [PtOs3(CO)12(NHC)] (3), [Pt2Os3(CO)12(NHC)2] (4) and [Pt3Os3(CO)12(NHC)3] (5), together with a trace amount of the tetraosmium cluster [Os4(CO)10(µ‐H)2(NHC)] (6). The reaction pathway is thus similar to that for Pd analogues, with the exception of cluster 6. Unlike their Pd analogues, however, these clusters do not appear to readily interconvert. With a valence electron count of 58, the clusters 6 are deficient by four electrons. 109. Q. Teng, H. V. Huynh,* "(Hetero)bimetallic and Tetranuclear Complexes of Pincer-bridged N-Heterocyclic Carbene Ligands" Organometallics, 2018, 37, 4119–4127. Site-selective mono-palladation of potentially pentadentate dipropyl-pyridine-2,6-dicarboxamide bridged diNHC proligands 1Bn/Me can be achieved by using different bases affording complexes of the type trans-[PdCl2(diNHC)] (3Bn/Me) and [PdCl(N’,N,N’)]BF4 (4Bn/Me), respectively, as metallo-proligands capable of binding additional metals. The 2nd palladation of both metallo-ligands using Pd(OAc)2, however, gave the same tetrapalladium complex 5, in which the ligand coordinates in a μ,κ4CN3,κC mode due to the entropically favorable tetradentate encapsulation of one PdII ion leaving a monodentate NHC coordination to the 2nd palladium center. Single deprotonation of the diazolium complex 4Bn affords the benzimidazolium complex 7 as the key intermediate in the formation of the tetrapalladium complex 5. Metallo-NHC precursor 7 also provides easy access to the hetero-bimetallic palladium/gold complex 8. 108. H. V. Huynh,* T. T. Lam, H. T. T. Luong " Anion influences on reactivity and NMR spectroscopic features of NHC precursors" RSC Adv., 2018, 8, 34960–34966. A series of 16 benzimidazolium salts of the type iPr2-bimyH+X– with various anions X were synthesized and characterized by various spectroscopic and spectrometric methods. Significant anion and solvent effects on the chemical shifts of the C2–H protons were found, which allows for a ranking of the anions in terms of their hydrogen-bond acceptor properties. Stronger acceptors could increase the acidity of their respective salts leading to a faster H/D exchange. Similar but less pronounced anion influences were detected for the 13CC2 NMR resonances, while 1JC2–H coupling constants appear to be anion and solvent independent. 107. V. H. Nguyen, B. M. El Ali, H. V. Huynh,* "Stereoelectronic Flexibility of Ammonium-Functionalized Triazole-Derived Carbenes: Palladation and Catalytic Activities in Water" Organometallics, 2018, 37, 2358–2367. The postmodification approach allows convenient access to charge-tagged ammonium-functionalized bis(1,2,4-triazolin-5-ylidene)palladium(II) complexes even when the respective azolium salts are elusive. Bromo-functionalized 1,2,4-triazolium salts were first metalated to form the respective bromo-functionalized bis(NHC) complexes trans-[PdBr2(R-tazy-Br)2] (R = Ph, Cy, 1a,b). Subsequent postcoordinative nucleophilic substitutions converted the bromo into ammonium functions, leading to the water-soluble, charge-tagged complexes trans-[PdBr2(R-tazy-NEt3)2]Br2 (R = Ph, Cy, 2a,b). The catalytic activities of 2a,b in the aqueous Suzuki-Miyaura reaction were compared to those of their analogues 2c,d bearing more bulky mesityl and diisopropylphenyl substituents, and a detailed stereoelectronic profiling of the NHCs using %Vbur, HEP, and DFT calculations was conducted to rationalize their catalytic differences. Although all complexes are active, the more donating and less bulky complexes 2a,b performed significantly better than 2c,d at a very low catalyst loading of 0.001 mol %. 2a was found to be highly active for various aryl and heteroaryl bromides and some aryl chlorides. More importantly, this study discloses that NHCs with N-phenyl and N-cyclohexyl groups exhibit stereoelectronic flexibility, which could be the cause for the greater activities of their complexes. 106. J. Tan, H. Sivaram, H. V. Huynh,* "Gold(I) bis(N-heterocyclic carbene) complexes: Metabolic stability, in vitro inhibition, and genotoxicity" Appl. Organometal. Chem., 2018, 32, e4441. We report the profiling of the metabolic stability, normal cell inhibition, and genotoxicity of the two gold complexes [Au(iPr2-bimy)2]PF6 (1) and [Au(Fpyr)(iPr2-bimy)]PF6 (2), which show strong apoptotic activities in lung cancer cells. Liver microsomal tests revealed that the compounds have a relatively high half-life compared to midazolam and do not suffer rapid metabolism and in vitro clearance. The cytotoxic potential of these compounds were also relatively weak in normal cells, with higher IC50 values compared to cancer cells, with a 2–60 times difference. The Ames test revealed that the compounds do not give rise to any mutations as well. Overall, the compounds showed stability in liver microsomes, specificity for cancer cells, and a lack of genotoxic potential. 105. X. Yan, R. Feng. C. Yan. P. Lei, S. Guo,* H. V. Huynh,* "A Palladacyclic N-Heterocyclic Carbene System Used to Probe the Donating Capabilities of Monoanionic Chelators" Dalton Trans., 2018, 47, 7830–7838. A series of NHC-containing [C^N]- or [C^C’]-type palladacyclic complexes of the general formula [PdBr(iPr2-bimy)(L^X)] (5–8, 11, 12, iPr2-bimy = 1,3-diisopropylbenzimdiazolin-2-ylidene) have been synthesized and fully characterized. Using these complexes, the donating capabilities of monoanionic chelators were probed for the first time. The [C^N]-type palladacycles 5–8 were prepared from acetato-bridged dipalladium complexes [Pd(μ-CH3COO)(C^N)]2 (1–4) and iPr2-bimy∙H+Br–as precursors. In the case of the [C^C’]-type NHC-palladacycles (11, 12), the hetero-bis(NHC) complexes trans-[PdBr2(iPr2-bimy)(trz)] (8, 9, trz = 1,2,3-triazolin-5-ylidene) containing the iPr2-bimy probe were first prepared followed by acetate-assisted cyclopalladations. The 13Ccarbene NMR signals of the iPr2-bimy ligands in all complexes (i.e. HEP & HEP2 values) are found to rationally reflect the donating abilities of the incorporated trz or [L^X]-type chelators with the exception of the Bzpy ligand (Bzpy = 2-​(2-​pyridinylmethyl)​phenyl-​C,​N). This has been attributed to its larger bite angle, the resulting varied coordination geometry and the lack of electronic delocalization between the two donor units. The donicities of [L^X]-type chelators studied in this work were found to surpass those of all other bidentate ligands evaluated by HEP2 thus far. 104. Q. Teng, W. Wu, H. A. Duong,* H. V. Huynh,* "Ring-expanded N-Heterocyclic Carbenes as Ligands in Iron-Catalysed Cross-Coupling Reactions of Arylmagnesium Reagents and Aryl Chlorides" Chem. Commun., 2018, 54, 6044–6047. The structure-activity relationship of expanded-ring N-heterocyclic carbenes (NHCs) in the iron-catalysed Kumada aryl-aryl coupling reaction was explored. This was achieved by comparing the catalytic performance of Fe-NHC catalysts generated in situ containing 20 NHCs that differ in steric bulk. In particular, the influences of ring sizes (five to eight) and N-aryl substituents were explored in terms of spectroscopic and structural features, which affect their %Vbur values. The three best performing ligands were found on a diagonal of a 5 × 4 structural matrix revealing an optimal steric bulk and significant influences of subtle steric variations on the catalytic activities. 103. H. V. Huynh,* "Electronic Properties of N-Heterocyclic Carbenes and Their Experimental Determination" Chem. Rev., 2018, 118, 9457–9492. N-Heterocyclic carbenes (NHCs) have become without doubt one of the most exciting and popular species in chemical science due to the ease of their preparation and modularity in stereoelectronic properties. Numerous types of NHCs have been prepared, and various experimental methodologies have been proposed for the study of their electronic properties in order to rationalize reactivities observed. The objective of this article is to provide a comprehensive overview of the most common and popular ones among them. In particular, these include the nickel(0)-based TEP, its rhodium(I) and iridium(I) variants, LEP and related electrochemical methods, the palladium(II)-based HEP, phosphinidene- and selenourea-based methods, as well as the use of direct 1J(C-H) coupling constants of the precarbene carbon in azolium salts. Each individual method and the underlying principle of detection it utilizes will be critically discussed in terms of strength and weakness. In addition, comprehensive amounts of data from various NHCs are compiled for the purpose of comparison. 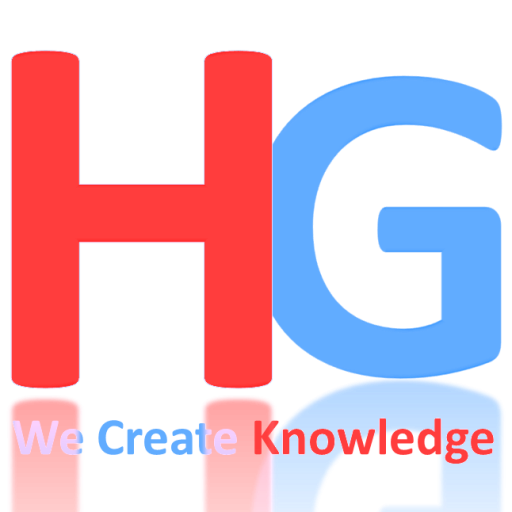 These are also meant to help the scientist in better understanding their own research data and possibly providing directions for their future research, which rely on the unique electronic properties of NHCs. 102. H. V. Huynh,* V. T. Pham, N. T. T. Chi,* "Cyclometallated Platinum(II) Complexes with a Phenylpropene-derived π/σ-Chelator and N-heterocyclic Carbenes" Eur. J. Inorg. Chem., 2017, 5650–5655. A series of heteroleptic platinum(II) complexes of the general formula [PtX(iPrEug)(NHC)] (2-7) bearing the organometallic π/σ chelator iPrEug (isopropyl eugenoxyacetate), varying halido and NHCs ligands derived from imidazole, benzimidazole and triazole have been prepared and fully characterized by elemental analyses, ESI mass spectrometry, IR and NMR spectroscopies. Complexes 3 and 5-7 were also characterized by single-crystal X-ray diffraction. The air-stable complexes are rare examples of platinum(II) compounds containing three different types of carbon donors, i.e. aryl, carbene and olefin. Unsymmetrical NHCs lead to rotameric pairs of 4 and 5 exhibiting different NMR spectroscopic features. Spectroscopic studies also revealed that the introduction of a NHC leads to a weakening of the metal-olefin bond and strengthening of the metal-aryl bond. Backbone and thus electronic variations among the NHCs on the other hand show little influence on the bonding of the iPrEug chelator. 101. H. V. Huynh,* C. H. M. Koh, V. H. Nguyen, "Heteroleptic nickel(II)-diNHC complexes and unusual 'reverse' carbene-transfer to silver(I)" Dalton Trans., 2017, 46, 11318–11326. A series of rare [NiX2(MeCCprop)] complexes bearing the cis-chelating benzimidazole-derived dicarbene ligand MeCCprop and varying anionic coligands (2, X = N3; 3, X = NCS; 4, X = I; 5, X = O2CCF3) have been prepared and coligand dependent structural and spectroscopic features have been evaluated. This study also revealed an unusual ‘reversed’ carbene transfer reaction from nickel to silver giving disilver species [Ag2X2(μ-κ2-MeCCprop)] (6, X = OAc; 7, X = O2CCF3). A preliminary catalytic study of two representative NiII diNHC complexes in the aqueous and phosphine-free Suzuki-Miyaura coupling of aryl halides is reported as well. These reactions provide good yields of coupling products, but do not require inert conditions. 100. V. H. Nguyen, M. B. Ibrahim, W. W. Mansour, B. M. E. Ali,* H. V. Huynh* "Postmodification Approach to Charge-Tagged 1,2,4-Triazole-Derived NHC Palladium(II) Complexes and Their Applications" Organometallics, 2017, 36, 2345–2353. Charge-tagged bis(1,2,4-triazolin-5-ylidene)palladium(II) complexes have been successfully synthesized via a post-modification strategy. Reacting PdBr2 with bromo-functionalized 1,2,4-triazolium salts A·HBr and B·HBr in the presence of silver oxide afforded the bis(carbene)palladium(II) complexes trans-[PdBr2(A)2] (1a) and trans-[PdBr2(B)2] (1b), which contain tethered bromoalkyl chains. Subsequent post-coordinative nucleophilic substitution converted the bromo- into ammonium groups, producing water-soluble complexes trans-[PdBr2(C)2]Br2 (2a) and trans-[PdBr2(D)2]Br2 (2b), while attempts to prepare ammonium-functionalized triazolium salts for direct metalation were futile. All four complexes were fully characterized by means of multinuclear NMR spectroscopy, ESI mass spectrometry, elemental analysis and X-ray diffraction analysis. The presence of trans-anti and trans-syn rotameric complexes in solution was elucidated by 1H, 13C NMR spectroscopy and theoretical calculations. Additionally, the two charged-tagged complexes, 2a and 2b, were found to be highly active precatalysts for the Suzuki-Miyaura and Mizoroki-Heck reactions in iPrOH/H2O and molten TBAB as ionic liquid. 99. W. Wu, Q. Teng, Y.-Y. Chua, H. V. Huynh,* H. A. Duong* "Iron-Catalyzed Cross-Coupling Reactions of Arylmagnesium Reagents with Aryl Chlorides and Tosylates: Influence of Ligand Structural Parameters and Identification of a General N‑Heterocyclic Carbene Ligand" Organometallics, 2017, 36, 2293–2297. A systematic evaluation of N-heterocyclic carbene ligands in the iron-catalyzed cross-coupling reactions of aryl chlorides and arylmagnesium reagents is performed. There is no clear correlation between the donor strength of the N-heterocyclic carbene and the reaction outcome. Instead, the highest yields of the desired biaryl product are obtained with sterically demanding ligands possessing large %Vbur values. Through this study, SIPrNap has been identified as an efficient and general ligand for the coupling of both aryl chlorides and tosylates. 98. M. Meier, T. T. Y. Tan, F. E. Hahn,* H. V. Huynh,* "Donor Strength Determination of Benzoxazolin-2-ylidene, Benzobisoxazolin-2-ylidene, and Their Isocyanide Precursors by 13C NMR Spectroscopy of Their PdII and AuI Complexes" Organometallics, 2017, 36, 275–284. A series of mono- and dinuclear palladium(II) and gold(I) complexes containing the iPr2-bimy reporter ligand and monodentate or Janus-type β-functionalized aryl (di)isocyanides have been prepared. Cyclization of the isocyanide ligands afforded complexes of monodentate or Janus-type N,O-heterocyclic carbenes (NOHCs) via a template-directed process. Using the iPr2-bimy 13Ccarbene signals in these complexes, the electron-donating ability of NOHCs and their isocyanide precursors could be evaluated and compared for the first time. Overall, NOHCs were found to be rather weakly donating carbenes. Spectroscopic comparison of mono- with dinuclear complexes indicated that electronic communication between two metal centers occurs only across the Janus-type diNOHC, but not for the diisocyanide ligand. Support for this claim was also found in the solid-state molecular structures, which revealed coplanarity of all ligands only in the diNOHC complex as a prerequisite for π-electron delocalization. 97. Q. Teng, H. V. Huynh,* "A unified ligand electronic parameter based on 13C NMR spectroscopy of N-heterocyclic carbene complexes" Dalton Trans., 2017, 46, 614–627. 96. B. Y. Tay, C. Wang, P. H. Phua, L. P. Stubbs,* H. V. Huynh,* "Selective hydrogenation of levulinic acid to γ-valerolactone using in situ generated ruthenium nanoparticles derived from Ru–NHC complexes" Dalton Trans., 2016, 45, 3558–3563. 95. Z. Li, L. Qian, L. Li, J. C. Bernhammer, H. V. Huynh, J.-S. Lee, S. Q. Yao,* "Tetrazole Photoclick Chemistry: Reinvestigating Its Suitability as a Bioorthogonal Reaction and Potential Applications" Angew. Chem. Int. Ed., 2016, 55, 2002–2006. The bioorthogonality of tetrazole photoclick chemistry has been reassessed. Upon photolysis of a tetrazole, the highly reactive nitrile imine formed undergoes rapid nucleophilic reaction with a variety of nucleophiles present in a biological system, along with the expected cycloaddition with alkenes. The alternative use of the tetrazole photoclick reaction was thus explored: tetrazoles were incorporated into Bodipy and Acedan dyes, providing novel photo-crosslinkers with one- and two-photon fluorescence Turn-ON properties that may be developed into protein-detecting biosensors. Further introduction of these photo-activatable, fluorogenic moieties into staurosporine resulted in the corresponding probes capable of photoinduced, no-wash imaging of endogenous kinase activities in live mammalian cells. 94. X. Xie, H. V. Huynh,* "Cyclometallated Ruthenium(II) Complexes with ditopic Thienyl-NHC Ligands: Syntheses and Alkyne Annulations" Org. Chem. Front., 2015, 2, 1598–1603. A series of six [RuX(2-thienyl-NHC)(p-cymene)] complexes (9a-c and 10-14; X = halido) have been prepared via NHC directed C-H activation. All complexes have been fully characterized, and the molecular structures of four complexes are reported. The rotational barrier of the N-benzyl substituent in the bromido complex 9b has been measured by variable temperature 1H NMR spectroscopy. Preliminary reactivity studies of complex 12 with alkynes provided four new annulated aza-heterocyclic thiophenes. 93. X. Xie, H. V. Huynh,* "Tunable Dehydrogenative Amidation versus Amination using a single Ruthenium-NHC Catalyst" ACS Catal., 2015, 5, 4143–4151. Mixed NHC/phosphine complexes of the type [RuCl(p-cymene)(bimy)(PPh3)]PF6 (bimy = benzimidazolin-2-ylidene) have been synthesized and fully characterized. Complex 1 bearing the 1,3-dibenzylbenzimidazolin-2-ylidene ligand is able to selectively catalyze both dehydrogenative amidation, mono- and di-amination (N-alkylation) through coupling of simple alcohols with amines effectively yielding a range of amides, secondary and tertiary amines. Selectivity is achieved by controlling the fate of the common hemiaminal intermediate, which in turn can be simply influenced by the choice of base and solvent. 92. S. Guo, J. C. Bernhammer, H. V. Huynh,* "1,2,4-Triazole-derived carbene complexes of gold: characterization, solid-state aggregation and ligand disproportionation" Dalton Trans., 2015, 44, 15157–15165. 91. A. M. Seayad,* S. P. Shan, X. Xiaoke, B. Gnanaprakasam, T. T. Dang, B. Ramalingam, H. V. Huynh,* "Benzimidazolin-2-ylidene N-heterocyclic Carbene complexes of Ruthenium as a Simple Catalyst for the N-alkylation of Amines using Alcohols and Diols" RSC Advances, 2015, 5, 4434–4442. 90. Q. Teng, H. V. Huynh,* "Controlled access to a heterometallic N-heterocyclic carbene helicate" Chem. Commun., 2015, 51, 1248–1251. Metallation of a pentadentate diNHC proligand bearing a dipropylpyridine-2,6-dicarboxamide with silver and gold affords mono- and dinuclear, double-stranded bis(NHC) complexes as useful building blocks for metallo-supramolecules. The digold(I) complex acts as a metallo-bis(pincer) ligand to furnish the first example of an organometallic NHC-helicate upon coordination to cobalt. 89. D. Yuan, H. V. Huynh,* "Hetero-dicarbene Complexes of Palladium(II): Syntheses and Catalytic Activities" Organometallics, 2014, 33, 6033–6043. A series of Pd(II) dibromido complexes 2–6 bearing cis-chelating hetero-dicarbenes, which contain two different types of NHCs linked by a propylene chain, have been synthesized. In most cases, the N-methyl-benzimidazolin-2-ylidene moiety was kept as one NHC donor, while the other one varies with different heterocyclic backbones. As an exception, the hetero-diNHC in complex 8 is derived by combining 1,2,4-triazole and indazole precursors instead. Analogous complexes 9–17 carrying more labile CF3CO2– or CH3CN ligands were synthesized by reacting the aforementioned bromido complexes with AgO2CCF3 or AgOTf in CH3CN. A systematic catalytic comparison of 9–17 in the direct arylation of pentafluorobenzene with 4-chlorobromobenzene was carried out, and complexes that contain bulkier and less electron-donating ligands were found to be more active. Complex 12 carrying the mesitylimidazolin-2-ylidene unit proved to be the most efficient, and its activity was also tested in the direct arylation of tetrafluorobenzenes. 88. Q. Teng, H. V. Huynh,* "Determining the Electron-Donating Properties of Bidentate Ligands by 13C NMR Spectroscopy" Inorg. Chem., 2014, 53, 10964–10973. A series of 15 mononuclear complexes [PdBr(iPr2-bimy)(L2)]PF6 (1–15) (iPr2-bimy = 1,3-diisopropylbenzimidazolin-2-ylidene, L2 = aromatic 1,2-diimines, diazabutadienes, or methylene-, ethylene- and propylene-bridged di-N-heterocyclic carbenes) and two dicarbene-bridged, dinuclear complexes [Pd2Br4(iPr2-bimy)2(diNHC)] (16 and 17) were synthesized and characterized by multinuclear NMR spectroscopy, electrospray ionization mass spectrometry, and in some cases X-ray diffraction analysis. The influence of the 15 bidentate ligands L2 on the 13Ccarbene signals of the iPr2-bimy reporter ligand in the chelate complexes was studied, on the basis of which a facile methodology for the donor strength determination of bidentate ligands was developed. 87. J. C. Bernhammer, H. V. Huynh,* "Nickel(II) Benzimidazolin-2-ylidene Complexes with Thioether-Functionalized Side Chains as Catalysts for Suzuki–Miyaura Cross-Coupling" Organometallics, 2014, 33, 5845–5851. Four bis(benzimidazolin-2-ylidene) nickel(II) complexes featuring thioether moieties in the side chain have been synthesized by reactions of the respective benzimidazolium salts with nickel(II) acetate in molten tetrabutylammonium bromide as an ionic liquid. All complexes were obtained as inseparable mixtures of trans-syn and trans-anti rotamers, as evidenced by NMR spectroscopy. For one of the complexes, X-ray diffraction confirmed the square-planar coordination geometry. The catalytic activity of all complexes for Suzuki–Miyaura cross-coupling was examined. Under the optimized conditions, both aryl bromides and aryl chlorides were successfully coupled in the presence of triphenylphosphine as additive. Yields ranged from good to moderate for electron-deficient aryl halides, while electron-rich aryl halides were found to be unreactive. 86. J. C. Bernhammer, H. V. Huynh,* "Amine-Functionalized Indazolin-3-ylidene Complexes of Palladium(II) by Post-Modification of a Single Precursor" Organometallics, 2014, 33,4295–4301. A series of five trans-[PdBr2(amine)(indy)] complexes (amine = diethylamine, dipropylamine, dibutylamine, diisobutylamine, morpholine; indy = indazolin-3-ylidene) with pendant teriary amine functionalities in the side chain of the NHC ligand has been prepared by postcoordinative modification of a single bromoalkyl-functionalized precursor complex. This approach allows for a synthesis of functionalized N-heterocyclic carbene complexes more efficient than the metalation of prefunctionalized azolium salts. All complexes have been fully characterized, and the molecular structures of three complexes are reported. A correlation exists between the 13C NMR shift of Ccarbene and the pKb values of the coordinated amines. Furthermore, all complexes were found to be active catalysts for the direct arylation of 1-methylpyrrole with good to excellent yields. 85. J. C. Bernhammer, H. V. Huynh,* "Palladium(II) Complexes Bearing an Indazole-Derived NHeterocyclic Carbene and Phosphine Coligands as Catalysts for the Sonogashira Coupling and the Hydroamination of Alkynes" Organometallics, 2014, 33, 3607–3617. Indazolin-3-ylidenes (indy) are among the most strongly donating N-heterocyclic carbenes, but the structural diversity of their complexes is still limited. Two dimeric palladium(II) complexes, [PdBr2(indy-5)]2 (2a) and [PdBr2(indy-6)]2 (2b) (indy-5 = 2,3-dihydro-1H-pyrazolo[1,2-a]indazolin-3-ylidene, indy-6 = 6,7,8,9-tetrahydropyridazino[1,2-a]indazolin-3-ylidene], bearing indazolin-3-ylidene ligands with different sizes of the fused aliphatic ring can be obtained by silver carbene transfer. The reaction of these dimers with pyridine yielded trans-[PdBr2(indy)(pyridine)] complexes (3a,b), while the poorly soluble monophosphine complexes cis-[PdBr2(indy)(PPh3)] (4a,b) were obtained by reaction with triphenylphosphine. Ligand substitution of the latter with silver trifluoroacetate afforded cis-[Pd(O2CCF3)2(indy)(PPh3)] complexes (5a,b) with improved solubilities, allowing for their detailed characterizations. In the presence of sodium tetrafluoroborate, cationic bis(phosphine) complexes trans-[PdBr(PPh3)2][BF4] (6a,b) could be obtained. Similarly, cis-[PdBr(dppe)][BF4] (7a,b) and cis-[PdBr(dppp)][BF4] (8a,b) were obtained (dppe = bis(diphenylphosphino)ethane; dppp = bis(diphenylphosphino)propane) with the respective chelating diphosphines. A preliminary catalytic study revealed that the complexes incorporating monodentate phosphine ligands are good catalysts for the Sonogashira cross-coupling, while moderate to good yields were achieved with all complexes for the hydroamination of carbon–carbon triple bonds. 84. Q. Teng, D. Upmann, S. A. Z. N. Wijaya, H. V. Huynh,* "Bis(functionalized NHC) Palladium(II) Complexes via a Postmodification Approach" Organometallics, 2014, 33, 3373–3384. A series of 20 bis(functionalized-NHC)-Pd(II) complexes have been conveniently synthesized through post-modification reactions of the common parent NHC complexes trans-[PdBr2(C3Br-bimy)2] (1a) and trans-[PdBr2(C3Br-imy)2] (1b) (C3Br-bimy/imy = 1-benzyl-3-(3-bromo- propyl)benzimidazolin/imidazolin-2-ylidene) with a N-C3Br tether. Dependent on the nature of the nucleophiles added, competing bromido ligand displacements also occurred. Compared to the conventional access to functionalized NHC complexes, which involves metallation of individually pre-functionalized azolium salts, this highly modular method proves more effective in cost and time savings. The tetraalkylammonium-functionalized complex trans-[PdBr2(C3NEt3-bimy)2]Br2 (14) as a product of 2nd generation post-modification of complex 1a was also tested for its catalytic activity in Mizoroki-Heck coupling reactions to study and model the effect of a catalytic amount of ammonium salt additive in Pd-catalyzed C-C coupling reactions. The ammonium functionalities in this complex exhibit a positive effect on the catalysis compared to its parent complexes. 83. J. C. Bernhammer, G. Frison,* H. V. Huynh,* "Pincer versus pseudopincer: isomerism in palladium(II) complexes bearing κ3C,S,C ligands" Dalton Trans., 2014, 43, 8591–8594. In NHC pincer complexes incorporating a hemilabile donor site, there exists an equilibrium between the true pincer form and a pseudopincer coordination isomer. The influence of the NHC moieties on this isomerism has been studied by DFT calculations. 82. S. Guo, H. V. Huynh,* "Dinuclear Triazole-Derived Janus-type N-heterocyclic Carbene Complexes of Palladium: Syntheses, Isomerizations, and Catalytic Studies towards Direct C5-Arylation of Imidazoles" Organometallics, 2014, 33, 2004–2011. The dipalladium triazolidin-diylidene complex all-trans-[PdBr2(CH3CN)]2(μ-ditz) (1) (ditz = 1,2,4-trimethyl-triazolidin-3,5-diylidene) was synthesized via in-situ deprotonation of the precursor salt with a basic metal precursor. Ligand replacements of all-trans-1 with monodentate or chelating phosphines afforded the dicarbene-bridged complexes all-cis-[PdBr2(PPh3)]2(μ-ditz) (2) and [PdBr(DPPP)]2(μ-ditz)Br2 (3), respectively. Bromido substitution of all-cis-2 gave tetra-acetato complex all-cis-[Pd(CH3COO)2(PPh3)]2(μ-ditz) (4) with retention of the configuration as the predominant product. In addition, mono-palladium triazolin-5-ylidene complexes trans-[PdBr2(CH3CN)(tazy)] (6, tazy = 1,4-dimethyltriazolin-5-ylidene), cis-[PdBr2(PPh3)(tazy)] (7), [PdBr(DPPP)(tazy)]Br (8), and cis-[Pd(CH3COO)2(PPh3)(tazy)] (9), were also synthesized as the respective mononuclear equivalents for comparison. A comparative catalytic study revealed the general superiority of dinuclear complexes 1–4 over their respective mononuclear counterparts 6–9 in the direct C5-arylation reaction of 1-methylimidazoles. Overall, mixed dicarbene/diphosphine complex 3 showed the best catalytic performance. 81. D. Yuan, Q. Teng, H. V. Huynh,* "Template-Directed Synthesis of Palladium(II) Sulfonate-NHC Complexes and Catalytic Studies in Aqueous Mizoroki–Heck Reactions" Organometallics, 2014, 33, 1794−1800. 80. J. C. Bernhammer, H. V. Huynh,* "Benzimidazolin-2-ylidene Complexes of Palladium(II) Featuring a Thioether Moiety: Synthesis, Characterization, Molecular Dynamics, and Catalytic Activities" Organometallics, 2014, 33, 1266–1275. Six benzimidazolin-2-ylidene palladium(II) complexes with an alkyl−alkyl thioether moiety in the side chain have been synthesized. Due to the hemilabile metal−sulfur bond, the complexes exhibit a marked fluxionality, as evidenced by NMR studies. The thioether moiety is readily displaced by pyridine as well as by another NHC ligand. Hetero(bis)-NHC complexes formally derived from all six chelating mono-NHC complexes have been synthesized as well. For both series of complexes, the catalytic activity has been explored, and they were found to be active catalysts for the intermolecular hydroamination reaction between a sterically hindered aniline and an alkyne in the presence of triflic acid. Furthermore, the complexes catalyze the direct arylation of 1-methylpyrrole. 79. J. C. Bernhammer, H. V. Huynh,* "Platinum(II) Complexes with Thioether-Functionalized Benzimidazolin-2-ylidene Ligands: Synthesis, Structural Characterization, and Application in Hydroelementation Reactions" Organometallics, 2014, 33, 172−180. A series of six benzimidazolium salts with an alkyl−alkyl thioether moiety in the side chain has been synthesized. While it was impossible to obtain the platinum(II) complexes by direct reaction between ligand precursors and basic platinum salts, the mild silver carbene transfer reaction gave the desired complexes in all cases. X-ray crystallography confirmed the expected κ2C,S coordination mode of the benzimidazolin-2-ylidene ligands, with a cis arrangement of the carbene and the hemilabile thioether moieties in all complexes. Preliminary studies of the catalytic activity of these complexes showed them to be active catalysts for the intermolecular hydroamination of alkynes with sterically hindered anilines in conjunction with silver triflate. Additionally, the complexes catalyzed the hydrosilylation of alkenes with excellent yields and good regioselectivity. 78. Y. Liu, R. Ganguly, H. V. Huynh,* W. K. Leong* "Palladium−Osmium Heterometallic Clusters Containing N‐Heterocyclic Carbene Ligands" Organometallics, 2013, 32, 7559−7563. The room-temperature reaction of [Os3(CO)12] with [PdCl(allyl)(NHC)], where NHC (N-heterocyclic carbene) = SIPr [N,N′-bis(2,6-diisopropylphenyl)imidazolidin-2-ylidene] or IPr [N,N′-bis(2,6-diisopropylphenyl)imidazolin-2- ylidene], afforded Pd−Os mixed metal clusters with formulas of [PdnOs3(CO)12(NHC)n] (n = 1−3). These are the first examples of Pd−Os heterometallic clusters containing NHC ligands, and they have all been structurally characterized. In all these clusters, the metal cores are raftlike, with carbonyl ligands bridging all the Os−Pd edges. 77. S. Guo, M. H. Lim, H. V. Huynh,* "Copper(I) Heteroleptic Bis(NHC) and Mixed NHC/Phosphine Complexes: Syntheses and Catalytic Activities in the One-Pot Sequential CuAAC Reaction of Aromatic Amines" Organometallics, 2013, 32, 7225−7233. A series of 2-coordinate heteroleptic Cu(I) complexes of the general formula [Cu(IPr)(L)]PF6 (2–5, L = NHC or phosphine) have been synthesized via either (i) chlorido substitution by phosphine or in situ generated free NHC or (ii) the Ag–NHC transfer protocol using [CuCl(IPr)] (1) as a precursor (IPr = 1,3-bis(2,6-diisopropylphenyl)imidazolin-2-ylidene). The reactions of precursor 1 with diphosphine ligands afforded 3-coordinate heteroleptic Cu(I) complexes of the type [Cu(IPr)(L2)]PF6 (6 and 7, L2 = diphosphine). Complexes 1–7 have been subjected to a catalytic one-pot sequential CuAAC study, in which aromatic amines serve as the precursors to aryl azides. Hetero-bis(NHC) complexes 2–4 proved to be generally superior compared to their mixed NHC/phosphine counterparts 5–7. Overall, complex [Cu(Bn2-imy)(IPr)]PF6 (2), bearing the Bn2-imy (Bn2-imy = 1,3-dibenzyl-imidazolin-2-ylidene) co-ligand, showed the best catalytic performance. Angew. Chem. Int. Ed., 2013, 52, 12110−12113. A key suspect arrested: The initial site of attack of a free N-heterocyclic carbene (NHC) on the triosmium carbonyl cluster [Os3(CO)12] was found to be a carbonyl ligand. The stable zwitterionic species thus formed (blue background in the scheme) was characterized crystallographically. CO substitution proceeds from this intermediate by the loss of a CO group and migratory deinsertion. 75. H. V. Huynh,* S. Guo, W. Wu "Detailed Structural, Spectroscopic, and Electrochemical Trends of Halido Mono- and Bis(NHC) Complexes of Au(I) and Au(III)" Organometallics, 2013, 32, 4591−4600. A complete series of ten Au(I) and Au(III) NHC complexes of the general formula [AuIX(iPr2-bimy)] (1–3, X = Cl, Br, I), [AuI(iPr2-bimy)2]BF4 (4), [AuIIIX3(iPr2-bimy)] (5–7, X = Cl, Br, I) and trans-[AuIIIX2(iPr2-bimy)]BF4 (8–10, X = Cl, Br, I) bearing the iPr2-bimy ligand and all three common halido ligands have been synthesized and fully characterized. Detailed trends in their NMR and UV–Vis spectroscopic properties have been studied, and their electrochemical behavior have been probed by cyclic voltammetry. The solid state molecular structures of all new complexes determined by single crystal X-ray diffraction are also described. 74. J. C. Bernhammer, G. Frison,* H. V. Huynh* "Electronic Structure Trends in N-Heterocyclic Carbenes (NHCs) with Varying Number of Nitrogen Atoms and NHC-Transition-Metal Bond Properties" Chem. Eur. J., 2013, 19, 12892−12905. Carbenes derived from five-membered heterocycles with different numbers of nitrogen atoms ranging from two to four lead formally either to normal N-heterocyclic or mesoionic carbenes with, in some cases, the same skeletal structure. The electronic structures of fourteen of these compounds were examined by means of DFT calculations at the B3LYP/aug-cc-pVTZ level. The examined parameters include the energies of the σ-lone pair at Ccarbene and the π-HOMO of the protonated form, which are correlated to the first and second proton affinities. The singlet–triplet energy gap was used as a measure of the stability of the N-heterocyclic carbene (NHC) towards dimersation. Natural population analysis provided insight into the variation of the pπ population and the natural charge at Ccarbene with NHC structure. Additionally, the transition metal-NHC bond in L-AuCl and L-TiCl4 and the nature of the orbital interactions between the NHC and the transition-metal fragment were analysed in detail by the extended transition state–natural orbitals for chemical valence (ETS–NOCV) approach at the BP86/TZ2P level. Similarities and differences between the NHC-gold and the NHC-titanium bond are discussed, and trends in key bonding properties can be traced back to the variation of the electronic parameters of the NHC. 73. H. Sivaram, J. Tan, H. V. Huynh* "Cationic gold(I) heteroleptic complexes bearing a pyrazole-derived N-heterocyclic carbene: syntheses, characterizations, and cytotoxic activities" Dalton Trans., 2013, 42, 12421−12428. A series of cationic gold(I) heteroleptic complexes bearing the pyrazole-derived N-heterocyclic carbene (NHC) FPyr (1,2,3,4,6,7,8,9-octahydropyridazino[1,2-a]indazolin-11-ylidene), and either a 1,3-disubstituted benzimidazole-derived NHC of the type RR′-bimy (3: R = R′ = CHPh2; 4: R = CHPh2, R′ = iPr; 5: R = R′ = CH2Ph; 6: R = R′ = iBu; 7: R = R′ = n-Pr; 8: R = R′ = Et; 9: R = R′ = 2-propenyl) or a non-NHC co-ligand L (10: L = PPh3; 11: L = P(OPh)3; 12: L = DMAP) (DMAP = 4-dimethylaminopyridine) have been synthesized from [AuCl(FPyr)] (1). Complexes 3-12 have been characterized using multinuclei NMR spectroscopies, ESI mass spectrometry, and elemental analysis. X-ray diffraction analyses have been performed on complexes 5, 6, and 9-11. To the best of our knowledge, 11 represents the first gold–NHC complex to bear the P(OPh)3 ligand. The cytotoxic activities of complexes 3-12 have been studied in vitro with the NCI-H1666 non-small cell lung cancer cell line. 72. H. V. Huynh,* H. L. Ong, J. C. Bernhammer, G. Frison "A Pd(II) complex bearing a benzimidazole-derived ligand with potentially ”mesoionic and remote” character and its catalytic activity" Eur. J. Inorg. Chem., 2013, 4654−4661. Oxidative addition of Palladium(0) to the C2 protected 5-bromo-2-methyl-benzimidazolium tetrafluoroborate (3) affords the complex trans-[PdBr(bimy)(PPh3)2]BF4 (4), which is the first complex of an unprecedented benzimidazole-derived ligand (bimy) with a potentially “mesoionic and remote” character. DFT calculations revealed that the bimy ligand bridges the gap between the mesoionic pyrazolin-4-ylidene and the anionic phenyl ligand. A preliminary catalytic study revealed the promising activity of complex 4 in the Sonogashira coupling of aryl bromides with phenylacetylene. 71. S. Guo, H. Sivaram, D. Yuan, H. V. Huynh* "Gold and Palladium Hetero-Bis-NHC Complexes: Characterizations, Correlations, and Ligand Redistributions" Organometallics, 2013, 32, 3685−3696. A series of new Au(I) hetero-bis-NHC complexes [Au(iPr2-bimy)(NHC)]X (X = BF4, PF6, 2–6) and the hetero-tetrakis-NHC complex [Au2(iPr2-bimy)2(μ-ditz)](BF4)2 (7) have been synthesized using the Au(I) acetato complex [Au(O2CCH3)(iPr2-bimy)] (C) as a basic metal precursor (iPr2-bimy = 1,3-diisopropylbenzimidazolin-2-ylidene, ditz = 1,2,4-triazolidine-3,5-diylidene). The Au(III) hetero-bis-NHC complex trans-[AuCl2(iPr2-bimy)(Bn2-bimy)]BF4 (12; Bn2-bimy = 1,3-dibenzylbenzimidazolin-2-ylidene) and the hetero-tetrakis-NHC complex all-trans-[Au2Cl4(iPr2-bimy)2(μ-ditz)](BF4)2 (13) were obtained by oxidation of their corresponding Au(I) hetero-NHC precursors. For all Au(I) hetero-NHC complexes, the 13C carbene signals of the constant iPr2-bimy ligand are found to be highly correlated with those in Pd(II) analogues of the type trans-[PdBr2(iPr2-bimy)(NHC)], which could be applied to detect the σ-donating ability of the trans-standing NHC. In addition, an interesting ligand redistribution process was observed for some of the Au(I) hetero-bis-NHC complexes. 70. D. Yuan, H. V. Huynh* "A Comparative Study on Di- and Multinuclear Ni(II), Pd(II) and Pt(II) Complexes of a Thiolato-Functionalized, Benzannulated N-Heterocyclic Carbene Ligand" Inorg. Chem., 2013, 52, 6627−6634. Dimeric thiolato-bridged Ni(II) and Pt(II) NHC complexes 2 and 4 have been synthesized from ligand precursor A through a combined and in situ deprotonation/hydrolysis protocol of a thioester-functionalized benzimidazolium salt in the presence of the respective metal salts. Reactivity studies of 2 and 4, and their previously reported Pd(II) analogue 1a toward either Me3OBF4, NaOH or Na2S•9H2O revealed clear differences. Complex 2 decomposed when treated with Me3OBF4. On the other hand, its reaction with aqueous NaOH solution in the presence of NaBF4 yielded trinuclear [Ni3S3O] complex 6, which possesses an interesting [Ni3S3] triangle with a capping μ3-oxido ligand. Pt(II) analogue 4 was converted to the tetranuclear [Pt4S4] macrocycle 5 when treated with Me3OBF4, in analogy to the result from 1a, while no defined products could be isolated when 4 was treated with either NaOH or Na2S•9H2O. Pd(II) analogue 1a reacted with Na2S•9H2O to give the tri-palladium [Pd3S3S] complex 7 bearing a capping μ3-sulfido ligand. 69. H. V. Huynh*, Chen-Shiang Lee "Pincer-type di(1,2,4-triazolin-5-ylidene)Pd(II) complexes and their catalytic activities towards Cu- and amine-free Sonogashira reaction" Dalton Trans., 2013, 42, 6803–6809. Pd(II) complexes [PdBr(A-κ3CNC)]Br (1) and [PdBr(B-κ3CNC)]Br (2) with new CNC pincer-type ligands derived from 1,2,4-triazolin-5-ylidenes have been synthesized and characterized by multinuclei NMR spectroscopies, ESI mass spectrometry and X-ray diffraction analysis. The more soluble complex 1 proved to be an efficient pre-catalyst in copper- and amine-free Sonogashira reaction with high turnover numbers. The potential for recycling of the catalyst was also demonstrated. 68. S. M. Puah, H. V. Huynh, J. C. Wu* "Novel two-in-one bioreactor greatly improves lactic acid production from xylose by Lactobacillus pentosus" J. Chem. Technol. Biotechnol. 2013, 88, 594–598. 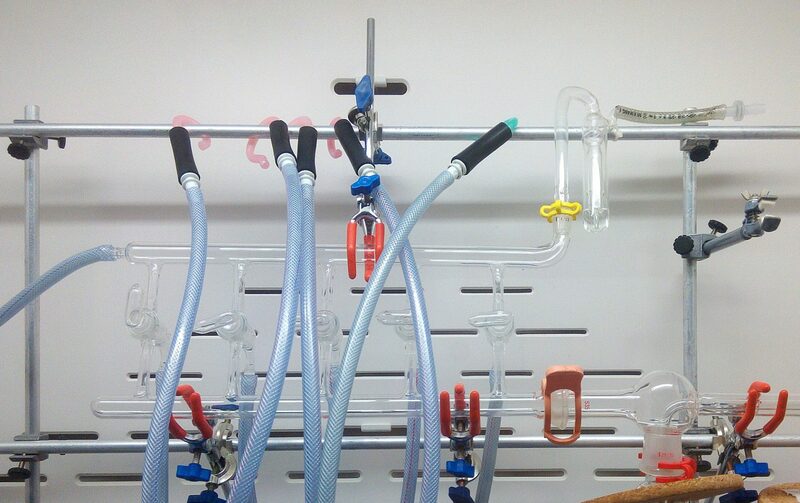 Simultaneous xylose isomerization and fermentation was investigated to improve the lactic acid production from xylose by Lactobacillus pentosus in a novel two-in-one bioreactor constructed by packing the immobilized xylose isomerase (65 g) in a fixed bed reactor (diameter 56 mm × 66 mm, packing volume 154 mL) with a permeable wall, which was installed inside a conventional fermenter (2 L) and rotated along the axis together with the mechanical stirrer of the fermenter. 67. H. V. Huynh*, Q. Teng "Highly modular access to functionalised metal-carbenes via post-modifications of a single bromoalkyl-substituted NHC–Pd(II) complex" Chem. Commun., 2013, 49, 4244–4246. 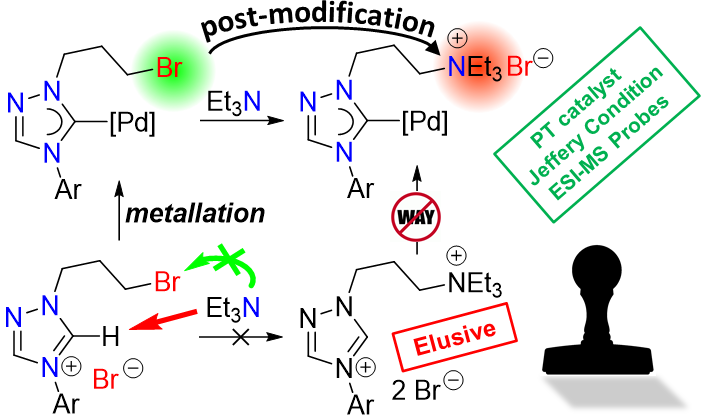 The synthesis of a bromopropyl-substituted NHC–Pd(II) complex, which can undergo exemplary and versatile 2nd and 3rd generation post-modifications easily affording 7 new functionalised NHC complexes, is demonstrated. 66. H. V. Huynh, G. Frison* "Electronic structural trends in divalent carbon compounds" J. Org. Chem., 2013, 78, 328–338. This work aims to analyze and compare the intrinsic electronic densities in a series of neutral and anionic divalent carbon-donor derivatives. The σ-lone pair at the divalent carbon is the HOMO of these species. Structural factors have been identified that influence its energy, which is a measure of the σ-basicity. The π-electronic structure has been described as a function of the π-population. Our results show that no straightforward structural criteria correlate with the π-electronic distribution. However, the π-population, as well as the π-acidity and π-basicity, are related to the π-MOs. In all cases these π-MOs can be qualitatively obtained based on those of the protonated analogues by simply increasing the energy of the pπ orbital at the divalent carbon atom compared to normal sp2 carbon. Such an analysis allows a rationalization of the trends observed for the π-electronic structure of these ligands. Notably, this explains the values of the π-population at the divalent carbon center, which shows an increasing and continuous range from classical NHCs to mesoionic "carbenes".